Credit to Pokemon and the Hoenn Region to Nintendo, Satoshi Tajiri and Gamefreak. Every forum has there own set of rules, and we are no different. In this board is where you can find all rules to due with the site, battling and amongst other things! Make sure to read this one. At this site, we often have updates due with rules, or events, or anything. So the members of the site are kept on date, they will be posted here every once in a while, so make sure to check back here every once in a while. Are you new to the site? Well introduce yourself here! We are very welcome to new members and we do appreciate them. Are you going to leave for a while? Then post it here so we know. Have you returned? Then post it here for us to warmly welcome you back! Here is where you have full creative control of your character, where you make and shape them to your liking. This is the place where completed character profiles are set for future readings and easier access when you need to overlook something. PokeMart is a convenience store that sells supplies necessary for Pokémon training. Some sell more items than others. Poké Marts also buy many different items in exchange for money. Much of the merchandise sold at such stores is produced by either Silph Co. or the Devon Corporation. Pokémon Centers are designed for Trainers so they can rest between activities. Trainers use Centers as gathering places, so they can share information about Pokémon. They also have access to video phones, PC with trading functions and most offer free food and lodging. Pokemon are healed in a process from 30 minutes to an hour. A large stadium-like area where contests are held. On the inside they have several areas for seating as well as a dirt battlefield, also to be used as a stage for the appeal rounds. Some contest halls are open air, while others are closed. Some are small, while others are larger. They are in most cities. "A town that can't be shaded any hue." A serene and calm town located in a secluded cove of the Hoenn region, surrounded by trees at all ends and made up of several houses. It's most notable feature is the Lab, where Professor Birch hands out starter pokemon to newbie trainers. "Where things start off scarce." A town of the Hoenn region which is located alongside a small port, where ships come in with new trainers on route to the Hoenn region. A small town with simple features that often serves as a checkpoint for trainers traveling to Petalburg City. "Where people mingle with nature." 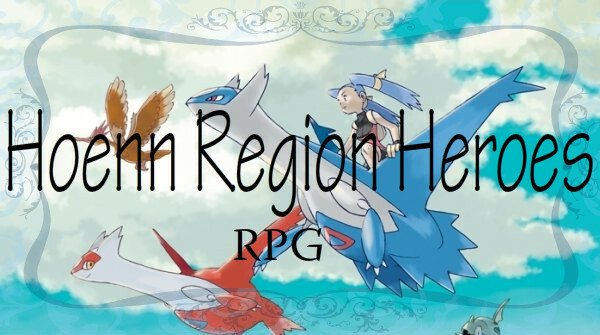 A city that sits on the western coast of the Hoenn region, known as an early and late stop for trainers. Although it has a gym, its the fifth gym that people encounter. It's known for being a festive town as well as the entrance to the Petalburg Woods. "The city probing the integration of nature and science." A bustling metropolis located on western Hoenn, and the exit of the Petalburg Woods. On top of being one of the largest cities in Hoenn, it's home to the first pokemon gym as well as the Devon Corporation, and a Pokemon Academy. "A tiny island in the blue sea." Dewford Town is an island south of mainland Hoenn. A popular spot for surfers to hang and relax at. It's most noticeable feature are its pokemon gym, and Granite Cave, a cavern to the north of the town. "The port where people and pokémon cross paths." The most noticeable and distinct harbor in the entire region, is Slateport. The town has many features, including that of a Lighthouse, Market, Museum, Beach, and lastly a Contest Hall. Although it lacks a gym, this is a distinct stop for both trainers and coordinators as some items are only found here. "The bright and shiny city of fun!" The town is located in central Hoenn, and therefore, is a hub for travelers throughout the region. What attracts people to Mauville is the Bicycle Shop and the Game Corner, but most importantly the city is the home to the third gym of Hoenn. "The windswept highlands with the sweet fragrance of grass." A small, pretty central town in Hoenn known for its good air and contest hall. To the north of the city is one exit, Rusturf Tunnel, which is being used to connect Rustboro City to Verdanturf Town for easier access through the region for travelers. "An excellent place for relaxing!" A small, relatively central town in the Hoenn region, known for its location at the foot of Mt. Chimey and being the home to both a pokemon gym, and the hot springs. According to legend, the Lavaridge hotsprings calm tension, relieve muscle ache, solve romantic problems, and attract money. It has the fourth regional gym. "A farm community with small gardens." A small, subtle community in north-eastern Hoenn. It has an extremely close location to Mt. Chimney, as so much of the ash from the volcano falls over the town. This town is seldom visited, and the only thing that keeps people coming is the Contest Hall in the city. "The treetop city that frolics with nature." The people of Fortree live in treehouses, and travel around on a system of rope bridges that hang in the treetops. Because of the physical exertion needed for such a lifestyle, they are all healthy and fit, and it also is home to a gym and desk and chair shop. "Where the land ends and the sea begins." Lilycove is located in eastern Hoenn, and is one of the many cities connected to the sea. It's home to a Contest Hall, Museum, Motel and also holds the entrance to Mt. Pyre and secret bases to the evil Team Aqua. "Cherish pokémon!" Mossdeep City is an island along the eastern edge of the Hoenn region. Many divers live here, as a favorite pastime and city attraction is "Wailmer watching". It is home to the Mossdeep Space Center, the closet place to space, as well as home of the twin kid psychic gym leaders. "The mystical city where history slumbers." Sootopolis City is located inside a crater formed by a volcano. Many years ago, an underwater volcano erupted and forced itself up from the depths creating a crater, the hollowed volcano. Only accessibly by ferry, its the home to the final gym of Hoenn. "The paradise of flowers, the sea, and Pokémon." This is a large city, built on a reservoir, with many houses, restaurants and shops in the area. It's known for the large stadium in the center where the Pokemon League Tournament is held, as well as the Grand Festival. Either 8 badges or 5 ribbons are needed to enter either, and press is constantly covering the event.